In the previous chapter, both deterministic and probabilistic coverage control schemes were developed for domain search problems, which serve as the foundation for the decision-making strategies developed in the subsequent chapters. 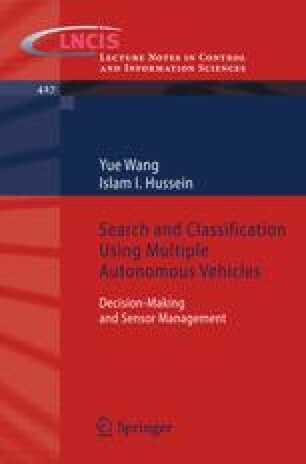 This chapter presents deterministic awareness-based decision-making strategies for the search and classification of multiple unknown objects of interest using MAVs. This is based on the awareness model developed in Section 2.3. We first introduce the problem setup in Section 3.1. In Section 3.2, both search and classification metrics are introduced and justified. Both centralized and decentralized decision-making strategies are developed in Section 3.3. The decision-making strategies guarantee: (1) the full coverage of a domain of interest, and equivalently, the detection of all objects of interest in the domain with probability one, and (2) the classification of each object’s “state” for a minimum guaranteed amount of time τ c .